Lowest turnout since WW2: Final numbers are still being tallied, but at this point it looks pretty clear that turnout in these midterms was the lowest overall in 70 years. Turnout of the voting-eligible population was just 36.4 percent, according to the projection from the United States Elections Project, run by Dr. Michael McDonald at the University of Florida. That’s down from the 41 percent that turned out in 2010. 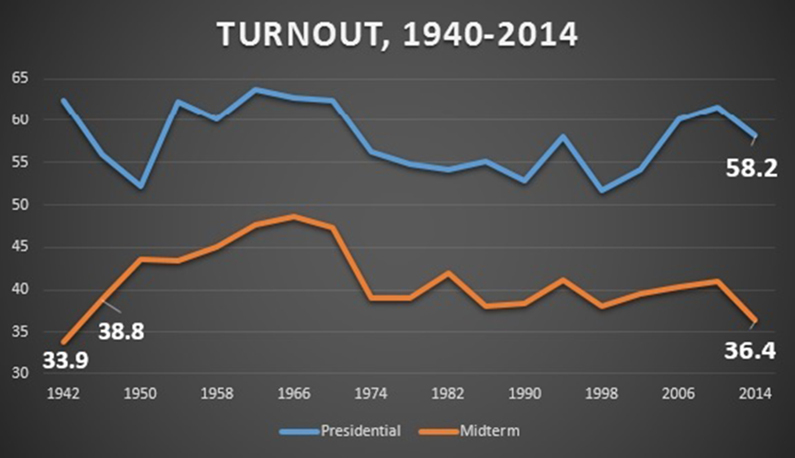 You have to go all the way back to 1942 for lower numbers when turnout in that midterm was just 33.9 percent. They had a pretty good excuse back then — many adult-age Americans were preoccupied with fighting in a world war. Significantly factoring into the overall decrease because of its population was California, which despite a governor’s race was off by a quarter of its 2010 participation. Also factoring in — Ohio (down almost 20 percent), as well as New York and New Jersey, which were both down about 17 percent. 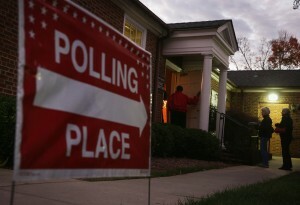 Even Georgia, despite its hotly contested Senate race, was down 14 percent. And for Democrats looking for what went wrong in blue states like Maryland and Massachusetts, turnout was down in those states by 10 percent as compared to 2010. Quote of the day: “Lose Mary Landrieu’s clout … for this?” “Whoa!” — a strikingly personal Sen. Mary Landrieu, D-La., campaign ad that takes aim at Rep. Bill Cassidy’s “coherence.” An announcer speaks the first part, with stammering clips of Cassidy throughout, followed by Cassidy’s, “Woah!” from the Republican Leadership Conference. Landrieu is the underdog in the Dec. 6 runoff. If Cassidy wins, it would give Republicans a 53rd seat. Daily Presidential Trivia: On this day in 1775, the U.S. Marine Corps founded. No American president has served in the Marines, but how many have served in the military? Be the first to tweet us the correct answer using #PoliticsTrivia and you’ll get a Morning Line shout-out. Congratulations to Roy Wait ‏(@ind22rxw) for guessing Thursday’s trivia: How many times did William Jennings Bryan run for president and against whom? The answer was: three times, twice against William McKinley and once against William Howard Taft. President Obama nominated Loretta Lynch, the U.S. Attorney for the Eastern District of New York, to succeed Attorney General Eric Holder on Saturday. President Obama admitted that his administration had not effectively sold their policies to the American people in an interview on “Face the Nation” Sunday. “It’s not enough to just build a better mousetrap,” he said. The president arrived in Beijing Monday morning for a three-day China visit. Rep. Scott Peters, D-Calif., won reelection Friday, after a new batch of ballots put him over the edge against Republican challenger Carl DeMaio. Texas Rep. Joaquin Castro and Massachusetts Rep. Joe Kennedy have emerged as frontrunners for chair of the Democratic Congressional Campaign Committee. House Minority Leader Nancy Pelosi will make the final selection. Senate Majority Leader Harry Reid could be ready to make a deal with Republicans regarding presidential nominees in order to avoid late nights and tough battles in his remaining weeks as majority leader. But the White House and Democrats might not be on board with Reid. The Democratic Senatorial Campaign Committee may have cancelled ads in Louisiana, but Sen. Mary Landrieu is receiving fundraising help from Alison Lundergan Grimes, Kay Hagan and James Carville, all of whom have sent email pitches on her behalf. Despite their midterm victory, Republicans still have a narrow path to the presidency. They must count on maintaining last week’s strong leads among rural, white voters, especially those who have gone Democratic in the past, and building support among Hispanics. Ads tying the GOP to the Koch brothers may not have had the intended effect this cycle, but Democratic strategists think they should be amplifying that message for their party to have greater success at the polls. Democrats are launching their own state-focused organization known as the State Innovation Exchange, or SiX, to compete with conservative groups like ALEC.